Justin Bieber used his extensive social media channels to plug a .tattoo domain name to his bazillions of “beliebers” last week, but so far the plug has had no impact on sales of the gTLD. The pop singer, beloved of 11-year-old girls worldwide, tweeted and Facebooked about the domain joker.tattoo, which leads visitors to his Tumblr blog. 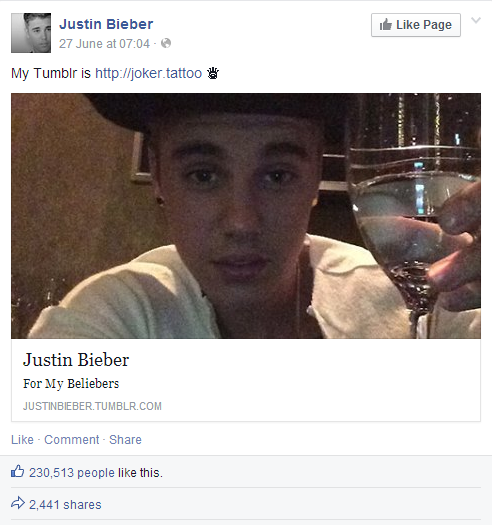 A Facebook update reading simply “My Tumblr is http://joker.tattoo” has been “liked” over 230,000 times and shared almost 2,500 times by the over 70 million people following him on the platform. On Twitter, where Bieber has 52.6 million followers, his identical tweet was retweeted over 50,000 times and favorited close to 60,000 times. The “news” was even picked up by MTV, which gently ribbed the musician for apparently (don’t ask me, I’m 37) not understanding that Tumblr isn’t just for “selfies”. But the widespread publicity for a .tattoo name had no impact whatsoever on .tattoo sales, judging by zone files. The Uniregistry TLD hasn’t grown by more than one name per day since Bieber’s tweet. One June 27 the .tattoo zone file had 6,312 names in it, today it has 6,316. The joker.tattoo domain — apparently chosen because Bieber has a tattoo of a joker — is registered to one of the founders of RockLive, a San Francisco selfie-oriented app start-up funded in part by Bieber. The domain redirects to a Tumblr third-level subdomain, so there’s no visibility for the new gTLD in browser address bars. There’s also the issue that most of Bieber’s fans are probably too young to own a credit card, which is a prerequisite for buying a domain name.